1. Talk to Family and Friends: First of all, when looking for a lawyer, we recommend that you start by asking family members and friends about criminal defense attorneys they know or perhaps have retained in the past. Even in this internet age with an overabundance of available information, there still is no substitute for a personal recommendation from someone you trust. And when you talk with your family members and friends, be sure to ask alot of questions about the attorney they have used or recommend: For example, ask about the attorney's experience in criminal law and whether or not the attorney gave them good, personal service. Also, ask about the attorney's fee schedule, (i.e. how much do they cost), and be sure to ask whether or not the attorney promptly returned their phone calls. Finally, ask questions to learn whether or not your family member or friend believed they got a good or fair result and whether or not they would use the attorney again. 2. Consult with (Bar) Referral Services: If you, your family members and friends don't know any attorneys, then you might consider contacting a lawyer referral service. Of course, if you are in a pre-paid lawyer referral service at work, then you may have to go this route. But your state or local bar association will also be a source of information about attorneys. 3. "Let Your Fingers Do the Walking....: Even though the trend in lawyer advertising is away from print media and toward the internet, you can still begin your criminal defense lawyer search by thumbing through the yellow pages of your telephone book. You will notice that there are attorneys who practice in a number of different areas of the law. Obviously, you want to focus on those attorneys who advertise in the area of criminal law matters. Also, if you have a federal criminal case, then you need to make sure that you focus on prospective attorneys having federal court experience. You may also consider whether or not the criminal defense attorney has prosecution experience in their background. As to the law firm advertisements, many of the ads will also refer you to the law firms' websites. Go there and get even more information to help you decide whether or not the criminal defense law firm merits a telephone call for a consultation. And one more bit of advice: We at The Goolsby Law Firm, LLC. recommend that you consider contacting criminal defense attorneys, like us, who offer a FREE INITIAL CONSULTATION! At our law firm, you can call and talk freely with a criminal defense attorney about your legal problems by simply calling us at (706) 863-5281. But be careful! Not all criminal defense lawyers offer a free consultation. Please be sure to ask the receptionist before you make an appointment! 4. Find a Lawyer Over the Internet: Finding an attorney over the internet is becoming one of the most common ways that people make their lawyer selections. There are several ways to accomplish this. The most obvious way is to simply sit at your computer and type in the key words, such as "augusta, Georgia criminal defense lawyers," or "augusta criminal attorneys," in one of the search engines. Of course, if you do not refine your search terms by confining your search to "Augusta, Georgia," then you may also get a plethora of choices from Augusta, Maine! You can also search online by going to online referral services, such as http://www.findlaw.com/. This will give you a large number of lawyers and law firms to choose from. Then, you can refine your search by going to the websites of the various criminal defense lawyers that appeal to you. 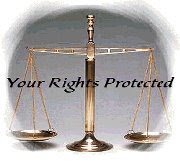 Again, we also advise you to check whether or not the attorneys offer a free initial consultation. 5. MEET THE LAWYER: And finally, no matter which method of finding a lawyer you utilize, we strongly urge you not to simply rely on what family or friends, or ads, or internet websites say. Instead, it is important that you meet with the prospective attorney, in person, to size them up, before you make your final decision! After all, when you select a criminal defense attorney to represent you, you should be satisfied that you have carefully found a lawyer who is not only an experienced criminal defense attorney, but also someone in whom you have complete confidence to handle one of the most important matters affecting your life. If you need to talk with an Augusta, Martinez, or Evans, Georgia criminal defense lawyer, please feel free to call us for a FREE INITIAL CONSULTATION at (706) 863-5281.